157 x 54 cm, mixed media on paper. Cold, really cold. Deer, rabbits, a wren, flock of pigeons circling overhead. The problem I have now painting outside in this weather is the temperature. 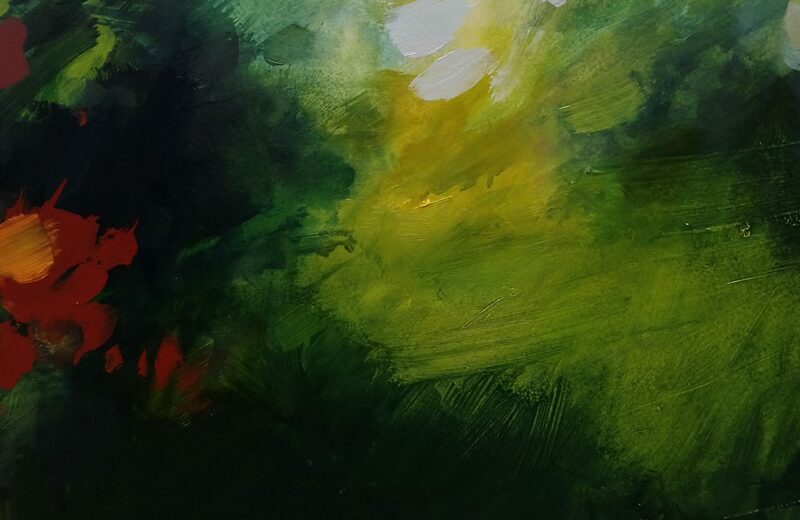 Paint starts behaving differently – it sits on the paper gloopily but as soon as I add any water the support itself becomes sodden , so I am left with wet paint and wet paper which refuses to dry. I stand around literally watching paint dry while my feet start to freeze in my wellies. Coldness seeps, and by the end of the morning I am shivering. The only thing to do is to make the decision that it won’t dry any further and then swiftly roll it up and get it back to the studio as soon as I can. Half an hour later and with the hairdryer on it the painting is dry and warm, less so me. Still, another amazing day spent in the company of trees. Wonderful. It rained in the woods today. The heavens open. Leaves tremble all around me with the splashing of raindrops. A gunmetal, pewter sky keeps the tin lid on things as I wait for a break in the weather. I know, I watched the forecast but the optimist in me says it will be fine……. The rain comes down harder, paint sliding off the paper, charcoal dissolving on touch. An image of tear stained mascara running down a face. By the end the paper is more like a wrung out handkerchief as I finally decide it is time to leave, but the feeling of this place today is caught, fleetingly, in black and white. Woman in a pink coat. While I wait at the bus stop in Kirkcaldy a queue has started to form and way at the back stands an elderly woman in a shockingly pink overcoat. I smile at her and motion there is some space to sit if she fancies, so she comes over, I squidge up and we settle together on the standy up seats. Her hair is soft and white and sits like a cloud on her head, cumulus bringing fair weather. I comment on her iridescent snake skin jewels of shoes and she says, ‘I do like a bit of colour’, her diamond earrings smiling with her in the sun. She tells me how cosy her house is and how she looks forward to the warmth after a mornings shopping. ‘Do you like my scarf ?’ she asks and I peep into a carrier bag to reveal a midnight blue sky with stars. ‘I got the matching gloves too’. Standing behind her an elderly woman carries a red plastic toboggan. ‘Hope you get the snow !’ I say and she touches the side of her nose laughing and says ‘Its for a project’. I am trying to imagine what kind of project as I get on the bus, whilst at the same time wondering where on earth my son might be. I think he is flying over the very far north of Russia. I remember I must buy eggs when I get back. Mixed media on paper – 83 x 55 cm.